Warm sunshine peeked under the brim of my hat, hovering low and to the south on its way to the winter solstice. The wind was brisk, though, stealing hard-earned heat through my thin running clothes. Just an hour ago, the breeze had whisked tiny snowflakes into a frenzy. In this transitional season, it feels like the thermometer is bouncing up and down like a toddler at Christmas. More than once, lately, I’ve stepped outside and been surprised. The gravel road ended at a gate, but I followed mountain bike trail signs around it to the two-track beyond. Clubmosses trailed among the pine needles, and chickadees scolded overhead. Here, out of the wind, I had to take off my hat and gloves. Then: Crunch! Crunch! Crunch! Here was another surprise, this time under my feet. The old roadbed was filled with fragile clusters of ice, pushing up through the soil. My clumsy feet had pulverized some, but in several places the ice remained beautifully sculpted into ribboned clusters a few inches high. Squatting down for a better look, I noticed soil particles, moss fragments, and grass blades frozen into the ice. “Needle ice” seems to be the most scientific term for this phenomenon, but I’ve also heard it called frost pillars, frost castles, and ice filaments. The Swedes, Germans, and Japanese have their own words for this circumboreal art form, too. While not confined to one region or habitat, needle ice does require a certain set of conditions in order to form. First, the soil must not yet be frozen, at least beyond the first thin crust. In contrast, the air temperature needs to be below freezing. Finally, the soil needs to have plenty of moisture, and just the right sized pores between the grains so that water can flow toward the growing ice. What draws the liquid water toward the ice is a process known as ice segregation. Supercooled water – held in a liquid state below 32 degrees F – moves toward ice and adds on to it. When the two meet, ice grows away from the ice/water interface. As the ice crystals expand upward, growing perpendicular to the surface, they may also push soil up or away, lift small pebbles into the air, and incorporate whatever debris is nearby. This fragile structure of ice and dirt is what crumbled under my running shoes. I’m not the only source of destruction, though. Once these frosted soils melt, they are loose and susceptible to erosion. If the needle ice forms on a slope, even just the action of lifting soil particles up and letting them down again will cause them to descend in the process of soil creep. Only certain soils are frost-susceptible, though. Very dense, clay soils do not promote water flow, and clean sand is too well-drained. The ratio between pore size (the space between the grains) and particle surface area must be within a range that promotes capillary action. This is the ability of the water to flow through narrow spaces without the help of gravity, and often against it. When the nurse pricks your finger and captures your blood in the tiny tube, it is capillary action that causes the flow. Silty and loamy soils–with particle sizes in between clay and sand–tend to be the most frost-susceptible. Knowing if a soil will promote ice needles is important if you’re going to build a road on top of it. As the freezing front descends deeper into the soil, the ice growth spreads horizontally into a lens shape, and can lift the soil above it up a foot or more in a frost heave. If just one place in the road is pushed up, the surface cracks, and a pothole forms. While we may curse that deep and destructive side of frost, the aerial side is more enchanting. Similar processes of additive crystal formation can create beautiful ribbons of “ice flowers” on the stems of plants, or flowing “hair ice” growing on soggy wood. When ice attracts moisture out of thin air, we wake up in a magical, white world covered in hoar frost. These interesting phenomena are most common in the transitional seasons, in weather that can surprise you from moment to moment. The surprise I’m waiting for now is waking up to a foot of skiable snow! The thick carpet of pine needles felt springy and dry under the trees. Patches of sunlight kindled warm fragrances to tickle our noses. On the wooden wildlife observation deck, though, an inch or so of soggy snow—not fit for November—dripped steadily through the planks. Skims of ice only clung to the shallowest pools in the marsh, and in one bay, a column of mist rose from the dark water. Although it was just past noon, the low angle of the sun illuminated the swirling cloud in soft light as it danced in partnership with the breeze. Abruptly, a raucous “kreh kreh kreh” erupted from the edge of the pines. My first thought was a merlin – a small falcon with a big voice. But merlins head south in September, and the peak of their migration is long past. I peered into the pine boughs where the sound originated, and caught a glimpse of a gray-colored bird a little bigger than a robin. As soon as I spotted it, the bird flew. Our visitor didn’t high-tail it into the bushes, though, it made an unhurried swoop toward us on downward angled wings, and perched in a nearby birch. There was no mistaking that flight pattern; the alarmist was a gray jay. The habitat range of these non-migratory birds--once called Canada jays—encompasses most of Canada up to tree line, and scoots just under the nose of Lake Superior like a mustache. Here at the southern edge of their range they aren’t very common. Usually I have my annual encounter with a “camp robber” in the Boundary Waters or Sax-Zim Bog north of Duluth. Why do they live so far north? Gray jays seem to be dependent on two things: a strong presence of certain tree species (black and white spruce and jack pine in our area), and cold temperatures. Both requirements relate to their food storage method. In order to survive the long, bitterly cold winters in their range, gray jays must put up food all summer and fall. They accomplish this by coating mouthfuls of food in sticky saliva, then gluing the boluses in tree crevices, under lichens, in evergreen needles, and behind the flaky bark of their preferred tree species. A gray jay may hide 1,000 separate caches of food in a single, 17-hour day. “Scatter-hoarding” is the technical term for this technique. “Gray jays have a memory like a Vegas card counter,” writes Joe Rankin in Northern Woodlands magazine, referring to the fact that the jays seem to be able to retrieve 80 percent of their food-filled saliva balls. At least a portion of the lost 20 percent is due to spoilage. Some boreal tree species may contribute antibacterial compounds that help the food stored under their bark stay fresh. But that’s not enough. Cold temperatures in the gray jay’s preferred habitats are necessary to prevent cached food, even chunks of meat, from spoiling. On this lovely, sunny, warm day in November, the vulnerability of these southernmost gray jays was driven home. Their refrigerator is broken. This is the warmest fall on record, and that doesn’t bode well for the longevity of cached meat and other food. Their reproductive rates may suffer, since gray jays nest in late winter, and feed nestlings from their caches. A study by the University of Guelph in Ontario confirmed that gray jays are food-limited during the breeding season. The researchers connected this with warmer fall temperatures allowing food to spoil and a 50% decline in numbers of gray jays in Algonquin Provincial Park over the past three decades. It’s not because they’re picky eaters, either. Gray jays are opportunistic omnivores, and they consume everything from small mammals, nestling birds, carrion, and arthropods to fungi, fruits, and seeds. They have been observed picking engorged winter ticks off the backs of moose. Anyone who has camped within their range knows that these “camp robbers” are not shy about snatching up a crust of bread off the picnic table, or nabbing a marshmallow before it can become a s’more. Our lack of food made us boring to the “camp robber” who came to investigate. He scrutinized us for only a minute before flying off. Since gray jays mate for life and stick together year-round, I would guess that this solo guy is a bachelor, and probably a young of the year. Even without the broken refrigerator, his is a tough lot. In early June, the two-month-old chicks begin an intense sibling rivalry. Only one dominant juvenile gets to stay with its parents, after driving the rest of the young away. These “stayers” gets access to their parents’ food caches and mentorship, in exchange for helping to raise little brothers and sisters the next summer. Even with the help, they still face a 52 percent mortality rate. The “leavers” that get kicked out may be able to volunteer their nanny services to an unrelated pair currently without chicks of their own. Or they may simply perish during the hungry winter. Leavers experience an astounding 85 percent mortality rate, while stayers only die about half the time. As we gazed over the wetlands and pine forests, the midday sun warmed my face and the unseasonable weather made me sigh. That lonely jay had every right to scold us for breaking his refrigerator. Gray jays are charismatic camp robbers that live close to their southern limits in Northern Wisconsin. Photo by Skip Perkins. The gleaming white magic of a winter wonderland enticed me outside after breakfast. With our first snow on the ground, the air tasted fresher, the brisk cold nipped my cheeks awake, and the world felt new. Above me stretched a lacework of light and shadow against the widening blue. All around me, the thin layer of sticky snow created lush patterns on the forest floor. Pebbles in the driveway, twigs on the ground, and ferns leaning over became works of modern art under their crust of white. 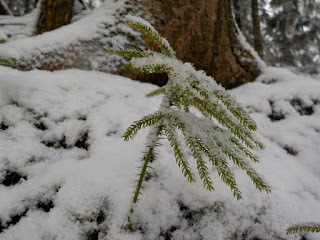 Christmas tree-sized balsam firs hugged their snow-laden branches close. In the understory, mini trees did the same. Only those mini trees aren’t really trees, at least not anymore. You might know them as ground pine, princess pine, or club moss. If you’re botanical, you might even know them by their genus Lycopodium (Greek for little wolf foot). None of those names are entirely accurate, though. These definitely aren’t pines, or mosses (or wolves! ), and new DNA studies have made the scientific classification more complicated, too. Lycopodiums are beautiful and amazing, though, and harken back to the Devonian and Carboniferous Periods more than 300 million years ago. At that time, North America was part of the supercontinent Pangea, and the eastern United States was positioned near the equator. Beautiful plants, gigantic insects, and strange forests covered the land. Increased precipitation, carbon dioxide, and oxygen created a very different world than we know today. The tropical climate produced extensive swamps dominated by tree-like or “arborescent” lycopsids that diverged from a common ancestor of our present-day clubmosses. These were some of the first plants to grow secondary tissue (wood), which was needed to support their impressive heights of 50 meters (164 feet). That is taller than the tallest white pines currently growing in Minnesota or Wisconsin. What’s crazy is that they couldn’t increase their girth along with their height. Each tree had to begin its life by growing its trunk as wide as it would ever be. The thick stump grew upward into a pole of the same diameter. Leaves – also known as microphylls because they only have a single vein down the center – grew along the trunk. With only the single vein, though, they had no way to transport the sugars produced by photosynthesis. As the tree gained height, the lower leaves fell off (creating a distinctive pattern on the trunk, and earning them the nickname “scale trees”), and the lower trunk essentially became dead tissue. At some predetermined height, the tree branched a certain number of times, reproduced, and died. With such a “quick and cheap” lifestyle, the arborescent lycopsids both grew and died rapidly. This allowed them to dominate habitats following short-term disturbances (like frequent fires), and leave behind a tremendous amount of woody debris in those tropical swamps. If you tried to imagine such a swamp today, you’d probably envision a mucky forest full of rotting logs. Back then, however, fungi hadn’t yet developed a good way to decompose wood – especially the tough, brown lignin in wood, and charcoal – so tree trunks would have lain around for years. Charcoal? In a soggy swamp? There is evidence that the high oxygen levels in the Carboniferous Period atmosphere allowed large-scale firestorms to sweep across the globe. The charcoal and other organic matter left in the swamps was eventually buried and turned into coal. The unique conditions present during the Carboniferous Period may never be repeated on Earth. As carbon in the air became locked up in coal deposits, in the explosion of land plants, and in limestone beds under the ocean, the conditions no longer supported giant lycopsids. They shrank into diminutive quillworts, while their cousins became the clubmoss we know today. Complex plants with seeds, extensive vascular systems, and trunks that could grow out as well as up succeeded instead. The branches of this new forest closed in over my head as I appreciated the beauty of our current non-tropical weather. Tiny, snow-capped lycopods dotted the understory landscape—their diminutive size hiding an immense history and adding to the magic of the forest. Nature is surprisingly old and always new. Lycopodiums (also known as club moss), dominated tropical forests 300 million years ago. Today, they are tiny, understory plants beneath a new era of trees. Photo by Emily Stone. Happy to exit the car after a long drive, I inhaled a sweet lungful of damp leaf perfume. A giant oak towered above the trailhead as we sauntered into the forest – eagerly, but also thoughtfully. We continued through a tall, damp meadow full of weed seeds and a mist so fine it swirled rather then fell. The brown, wooden shack with a white painted door stood in a small clearing. Although quite humble in appearance, there was a certain dignity about it, as well as an aura of wisdom. 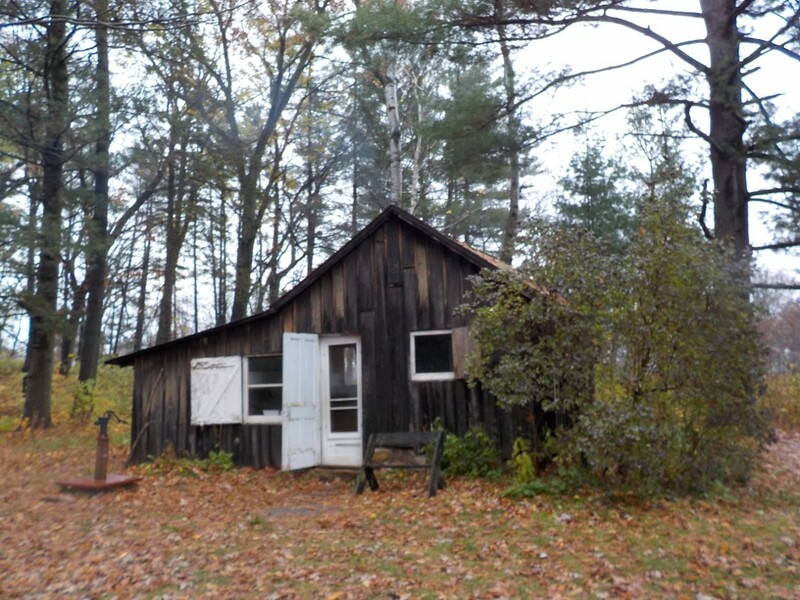 This shack was the weekend escape for a University of Wisconsin-Madison professor named Aldo Leopold and his family. On a worn-out, abandoned farm in the “sand counties,” Leopold set out to see if he could return health to the abused land. He also harvested--many times over--its crop of wisdom. I love that Leopold includes beauty as a value of nature. As we stood in front of the Shack, chatting with an educator from the Leopold Foundation, she waved her hand toward the elegant silhouettes of mature pines. “The Leopold family planted thousands of pines every spring,” she said. This forest is their legacy, their work of art. While Leopold may understate his role as an artist, the loveliness of his land boasts for him. “Some paintings become famous because, being durable, they are viewed by successive generations, in each of which are likely to be found a few appreciative eyes.” By the popularity and success of the Leopold Foundation’s program and message, it is clear that this shack, its farm, and their message is finding many appreciative eyes in successive generations. Chickadees chattered from the boughs. The leaves of sharp-lobed hepatic glistened in the understory. Lilacs, geese, “red lanterns,” of blackberries, birch, and the winding Wisconsin River – the characters from Leopold’s writing – all surrounded us on our walk through the autumn pines. Walking quietly, we reflected on the accumulated wisdom of this special place. Wisdom from the past that is needed for our future.